Read the press statement from the National Primary Healthcare Development Agency, warning Nigerians not to pay for the Meningitis vaccination, stating that it is free. The attention of National Primary Healthcare Development Agency (NPHCDA) has been drawn to news report of sharp practices of some health workers who are alleged to be demanding payments and other forms of financial incentives from innocent members of the general public before being vaccinated against Cerebrospinal Meningitis (CSM). The National Primary Healthcare Development Agency, therefore, wishes to put on record, emphatically, that vaccination against cerebrospinal meningitis, like other vaccination in the National Immunization schedule is provided free of charge for all members of the public by the Federal Government of Nigeria. It should be borne in mind by all patriotic, responsible and law-abiding citizens that the Federal Government spends billions of naira to procure, store, maintain and distribute such vaccines to all parts of the country including affected areas as the need arises. The public is therefore reminded once again that vaccines for immunization against all vaccine-preventable diseases in the Nigerian National Immunization schedule are provided free of charge by the Federal Government and under no circumstances must any health worker charge members of the public to pay for such free services. Members of the public are advised to report any health centre or health workers charging people to pay for the on-going meningitis vaccination in various parts of the country to the nearest Law Enforcement Agencies. Vaccines’ preventable diseases covered free-of-charge under the National Immunization schedule are Bacillus Calmette Guerin – (BCG), Poliomyelitis, Hepatitis B, Diphtheria, Pertussis and Tetanus toxoid-(Pentavelent vaccines) Haemophilus influenza type B, Pneumococcal vaccines, Inactivated Polio virus vaccines, Measles, Yellow Fever and of course, Meningitis vaccines. 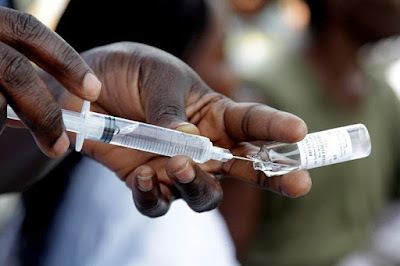 It will be recalled that sequel to outbreak of meningitis in some parts of the country, the Federal Government has made available 500,000 doses of meningitis vaccines while expecting delivery of additional 823,000 doses anytime from now to control the meningitis outbreaks. As a way of prevention, it is important to avoid overcrowded spaces, sleep in well-ventilated rooms, practice strict personal hygiene and avoid close and prolonged contacts with infected persons.